Each of five illnesses—J, K, L, M, and N—is characterized by at least one of the following three symptoms: fever, headache, and sneezing. None of the illnesses has any symptom that is not one of these three. Illness J is characterized by headache and sneezing. Illnesses J and K have no symptoms in common. Illnesses J and L have at least one symptom in common. Illness L has a greater number of symptoms than illness K.
Illnesses L and N have no symptoms in common. Illness M has more symptoms than illness J. Which one of the following statements must be false? Illness J has exactly two symptoms. Illness K has exactly one symptom. Illness L has exactly two symptoms. Illness M has exactly three symptoms. Illness N has exactly two symptoms. In which one of the following pairs could the first member of the pair be characterized by exactly the same number and types of symptoms as the second member of the pair? If illness L is characterized by a combination of symptoms different from any of the other illnesses, then which one of the following statements must be true? Fever is a symptom of illness L.
Sneezing is a symptom of illness L.
Headache is a symptom of illness L.
Illnesses K and N are characterized by exactly the same symptoms. Illnesses M and N are characterized by exactly the same symptoms. The illnesses in which one of the following pairs must have exactly one symptom in common? 1) What symptoms does each illness have? 2) What illnesses can, must, or cannot have the same symptoms as what other illnesses? Either a grid or a list works well with a matching set. You could use a 5 x 3 grid with the illnesses—J, K, L, M, and N—across the top, and the symptom ms—f, h, and s—along the side. This way you’d put a “√” when you match a symptom with an illness and an “X” when you know that an illness definitely doesn’t have that symptom. 1) Very concrete—put an “h” for headache and an “s” for sneezing under the J. 2) Think first, don’t just write “J ≠ K.” Each illness has at least one symptom, and Rule 1 just said that J has headache and sneezing; therefore K must have only fever. Put an “f” for fever and “no h” and “no s” under K. Also put “no f” under J. 3) L will have at least one (or both) of headache and sneezing. Let’s write “at least 1 same” and draw arrows between J and L.
4) Again, think before you draw. You know that K has exactly one symptom, so L must have two or three. Write “2 or 3” over L.
5) L and N don’t have any symptoms in common. Write an “≠” with arrows pointing to L and N to serve as a reminder. 6) Don’t just write “M > J.” Think through the rule first. What did Rule 1 say about J? J has two symptoms, so M must have all three. 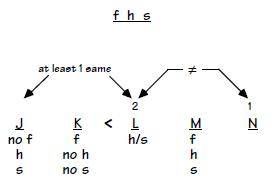 Write “f, h, s” under M.
We made a bunch of deductions along the way as we went through the rules above. But there’s even another deduction to be made from combining Rules 4 and 5 with what we already deduced about illness L: L has either two or three symptoms (Rule 4), but N has at least one symptom, so L can’t have all three symptoms (there would be none left for N—Rule 5). L, therefore, must have exactly two symptoms, and N must have exactly one symptom. Go back and change the “2 or 3” to just “2” over the L and write “1” over N.
Three of the five illnesses (J, K, and M) are entirely filled, and you know the exact number of symptoms for the other two illnesses, L and N. This is a ton of information and should lead to some quick and easy points. This question is a ten-seconder after all of our work with the setup. Scan the choices against what we’ve deduced. N has one symptom, not two as choice (E) has it. Once you’ve decoded this question stem, it’s just a matter of checking for the pair who could share exactly the same symptoms; that is, the same number and type. M is the only illness with all three symptoms so axe any choice that includes M, answer choices (D) and (E). We also know the numbers of symptoms for each of the illnesses; the only pairs that can possibly have the same number of symptoms are J and L (they each have two symptoms) or K and N (they each have one). J and L isn’t a choice, but K and N is, answer choice (C). Make abstract information concrete. L’s symptoms aren’t exactly the same as any other illness. L has two symptoms and so does J, but for this question they can’t share both of them. J has headache and sneezing. Rule 3 tells us that L shares at least (and in this question, exactly) one with J. So L’s other symptom must be fever, choice (A). Read carefully here. You may have marked (A) thinking that it was a direct restatement of Rule 3. But the question stem says “exactly” one symptom; Rule 3 states that J and L share at least one symptom, which means they can share two. Knowing the number of symptoms in each illness helps enormously here. It may have occurred to you that M, with all three symptoms, and either K or N, with exactly one symptom, would have to share exactly one symptom. Scanning the choices we see that M and N is the pair the testmakers chose in (E). (B) No, J with two symptoms must share exactly two with M.
(C) and (D) Both of these pairs of illnesses could share one symptom, but they can also share none. (A) No, J and L can share headache and sneezing, so axe (A). (B) N’s one symptom could be headache or sneezing; this kills (B). (C) We just saw in Q. 9 that L could share one of its two symptoms with K. Walter could have these two, so axe (C). (D) N’s one symptom could be fever, just like K.